The Fish that Ate the Whale by Rich Cohen, describes the life and times of “Sam, the banana man,” Samuel Zemurray. It also divulges interesting banana facts I’ll bet you never knew. How’s this: Bananas aren’t fruit; they are berries. Banana’s don’t grow on trees; they grow on herbs-or rather grasses, the world’s tallest, reaching as much as 30 feet tall. Banana berries grow on single stems with 100 bunches, each with 9 hands, 15 fingers or bananas per hand, weighing over 100 pounds per stalk. It’s impossible to read a book about the banana business without conjuring up banana recipes. In a square baking dish, mix all the marinade ingredients, then add the chicken. Marinate, refrigerated for 1-3 hours, then bake at 400F for 20 minutes, flipping half way through. Plate the chicken, reserving the sauce. 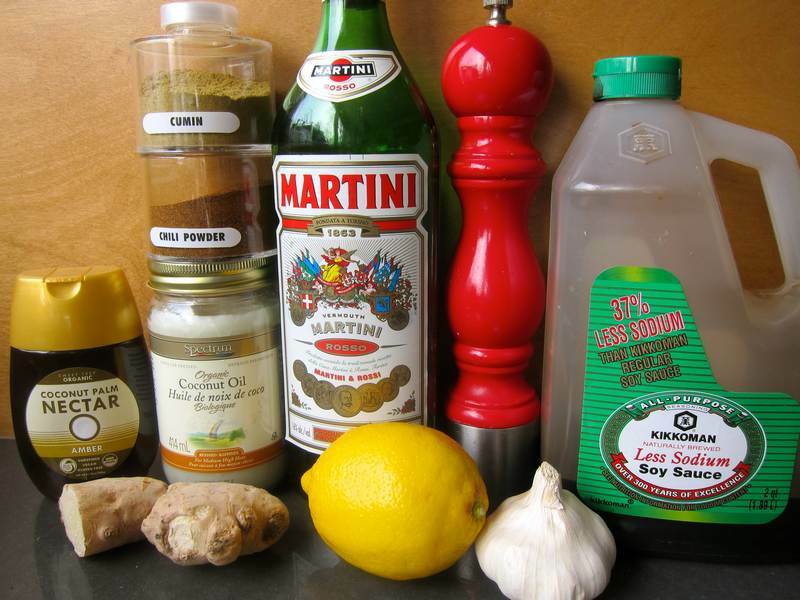 In a small frying pan, heat the vermouth. 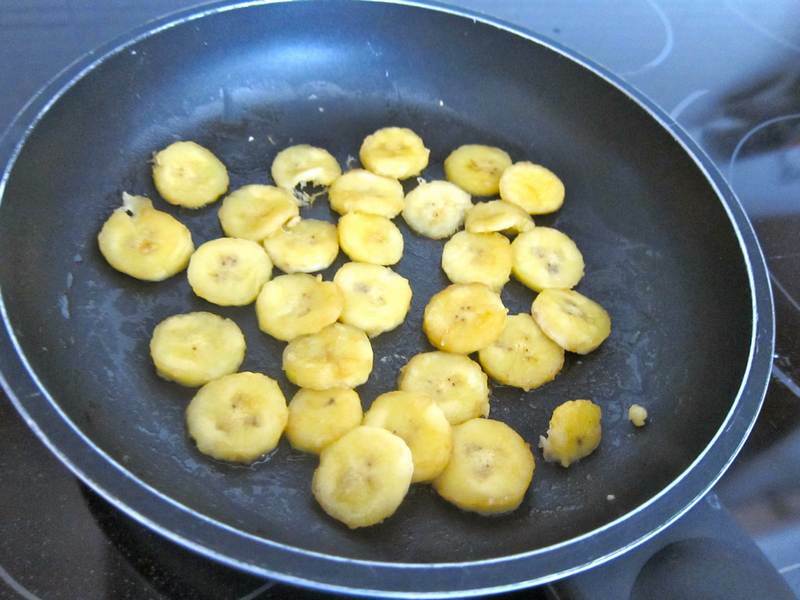 Add the sliced banana and sauté for a few minutes on medium heat, flipping once. 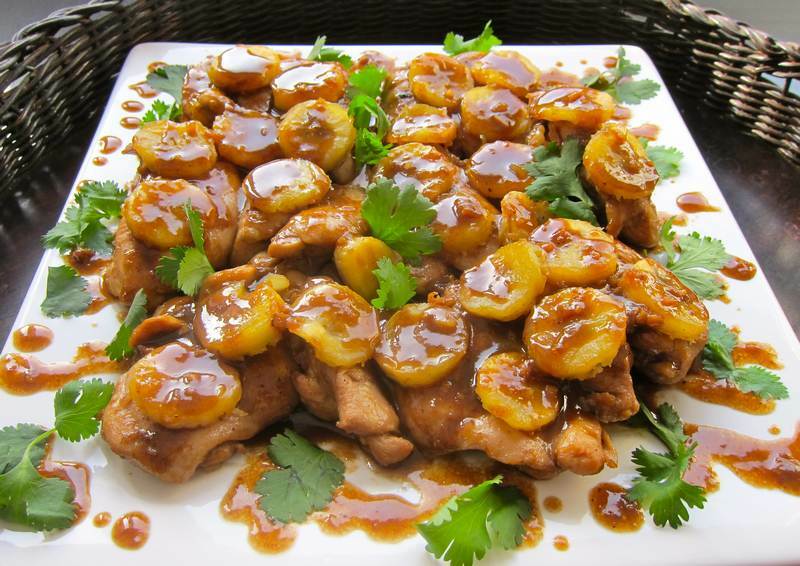 Place the banana slices on the chicken. Use the same pan to reduce the sauce on medium heat, until it is syrupy. Drizzle the sauce over the chicken and garnish with cilantro. Serves 4. 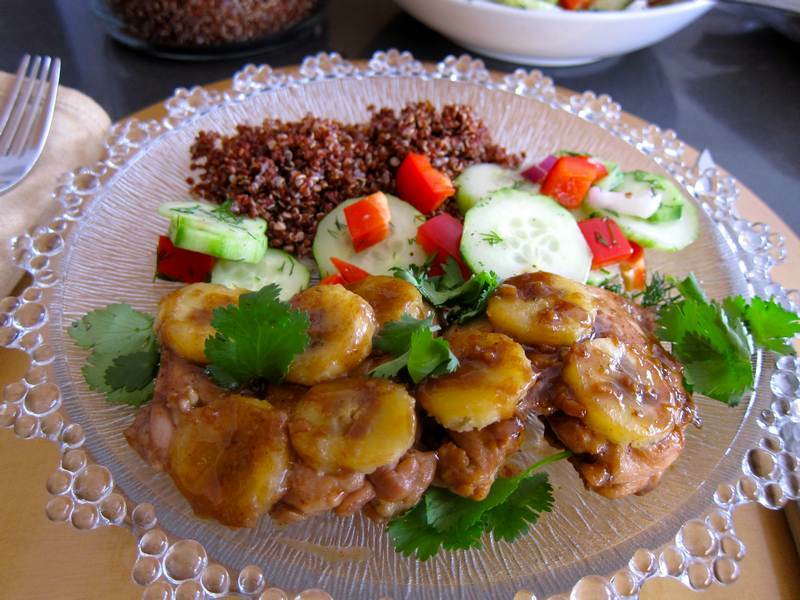 Thanks to Physio Shelley Alper for sending in the Honey-Lime Baked Chicken recipe that inspired this Drunk Banana Chicken. Thanks to Dr. Martin Eidinger for loaning me Rich Cohen’s lively, full of intrigue, banana business book. I see a movie-making opportunity here. Looking for more banana facts?